Heat your oven to 160 degrees. Line the base & then grease a 20cm round loose-bottomed cake tin. Place the almonds in your food processor and whiz on full speed until finely ground. Place the sugar, lemon zest & egg yolks in the bowl of your electric mixer with the balloon whisk and whisk until thick, creamy & pale. Tip in the ground almonds, cinnamon & lemon zest and whisk on a low speed until combined. In a separate bowl, whisk the egg whites until the stiff peak stage. Spoon in 1/4 of the egg whites to loosen and then fold in the rest; pour into your baking tin. Bake for 45 mins. Remove from the oven and place on a cooling rack. Place the ingredients for the syrup, plus one tablespoon of cold water, into a pan and heat until the sugar has dissolved. Spoon over the warmed cake. 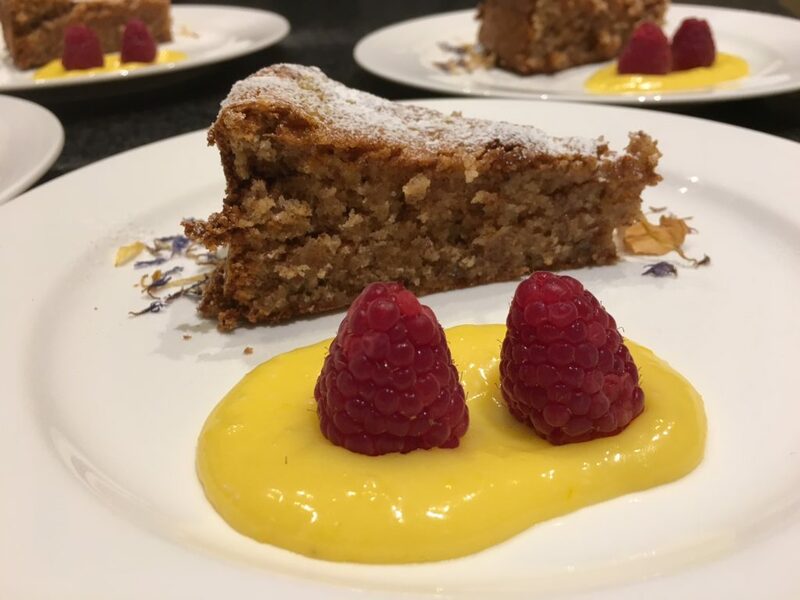 To serve, I make a lemon curd cream (I know, its not dairy free but when we have non-diary guests I buy a soya or coconut oil cream) and decorate with some fresh raspberries and a dusting of icing sugar. To make the lemon curd cream; place one large egg and one egg yolk in a non-stick pan and add 50 grams of icing sugar and whisk gently to combine; add 50 grams of unsalted butter and the zest & juice one one lemon – stir over a low heat until the cream thickens. Spoon the warm curd into a clean bowl and immediately place a piece of clingfilm directly on top (this stops it forming a skin) – pop in the fridge and remove just before serving, loosening it up with a spoon.